THE AHSAA BASKETBALL STATE FINALS, FORMERLY KNOWN AS THE FINAL 48, IS ONE OF THE TOP HIGH SCHOOL BASKETBALL CHAMPIONSHIP EVENTS IN THE COUNTRY. THE STATE FINALS BRINGS SEVEN CLASSIFICATIONS, BOYS AND GIRLS, TO THE LEGACY ARENA AT THE BJCC FOR THE SEMI-FINALS AND FINALS. ALABAMA WAS THE FIRST STATE TO ADOPT THIS FORMAT FOR CROWNING A STATE CHAMPION. Daily tickets can be purchased at the Legacy Arena ticket office. All daily tickets are $11 ($10 AHSAA fee + $1 Facility fee) and are good for ANY single day. On-­site ticket sales are $11 plus applicable service fees. However, through school ticket packages of 50 or more, tickets are discounted to $10 each. Your school’s support of this championship will continue to provide these competing student-­‐athletes the opportunity to experience a once-­‐in-­‐a-­‐lifetime championship! This event will attract more than 60,000 fans through the doors of the arena over a six-­‐day period, and we hope that many of your students and fans will be able to attend. Please fill out this order form (PDF) and return with payment. All tickets will be mailed to your address (or hand-­‐delivered if applicable). If you have additional questions, please contact Daniel Smith at [email protected]. Legacy Arena at the BJCC is conveniently located in the heart of downtown Birmingham and only 10 minutes from the Birmingham-Shuttlesworth International Airport. Combined with two hotels within walking distance, and the new Uptown Entertainment District, the State Finals is conveniently located for all participants and fans! DUE TO CURRENT CONSTRUCTION PROJECTS ON I-59 AND AREAS AROUND THE BJCC, FANS SHOULD EXPECT HEAVY TRAFFIC BOTH COMING AND GOING FROM THE BJCC. FANS PLEASE ALLOW EXTRA TIME TO GET TO THE ARENA ON GAMEDAY AS PARKING WILL BE AT A PREMIUM. Visit: 5920bridge.com for detailed information or use the app algotraffic. Take the 22nd Street exit from I-20/59 West (125). At the bottom of the ramp, continue straight across 22nd Street. At the next intersection, take a right on to Richard Arrington Jr. Blvd North. The Sheraton Birmingham Hotel and Medical Forum will be on your right, and the Arena is on your left. Take the Carraway Blvd Exit. At the second light, take a left on to Richard Arrington Jr. Blvd North. Travel four blocks and the arena will be located on your left. At the downtown interchange of I-20/59 and I-65, take I-20/59 East to Atlanta/ Gadsden. Take the 17th Street Exit (125A). At the first light, take a left on to 8th Avenue. Then take a left on to 19th Street. Travel under the interstate overpass and the Arena is on the right side of the street. The areas marked in light blue below are available paid public parking lots surrounding the BJCC. The two parking decks are also available for paid public parking. All team buses will park in the back of the 19th Street lot as indicated by the red square on the map. Fan bus and overflow team buses will park in the P12 Lot, as shown in the top right corner of the map. All media will park in the 19th Street Lot indicated on the MAP. The AHSAA issued press credential will act as your parking pass for this reserved lot. Handicap parking is located in various lots around the BJCC. The BJCC does not require a clear bag for entry into event. An express lane will be made available to those traveling with a clear bag or no bag. Make sure all bags do not exceed 14” x 14” x 6”. Requests for media credentials for the State Basketball Finals must be made through Ron Ingram with the AHSAA. Contact Ron at 334-263-6994 or go online to www.ahsaa.com. Media with AHSAA permanent credentials will be permitted to cover the event but must check in at the Tournament Office located at the 19th Street media entrance. Please notify the AHSAA of which days you plan to attend PRIOR to the state tournament to be guaranteed a spot on press row. All participating schools will receive (2) media passes for the day(s) that the school team is playing. Please contact Ron Ingram at 334-263-6994. The Alabama Cable network is proud to be partnering with the AHSAA to provide live TV coverage of the 2019 Alabama High School State Basketball Championships. The Alabama Cable Network can be found on Charter Spectrum Systems statewide on cable channel 80. ACN is available free of charge to any cable or satellite provider in the state of Alabama. Call your local provider and request they add ACN. The Radio Partner for the State Finals is R&B Media. All 42 games throughout the State Finals will be broadcast LIVE. For semi-finals and finals, CLICK HERE to follow the games on the AHSAA radio network. 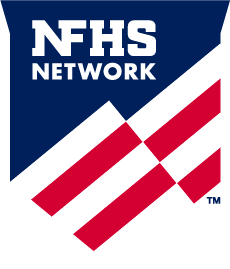 Watch every semifinal and final live on the NFHS Network. For a $9.95 subscription, you can watch every AHSAA Basketball game anytime, anywhere on NFHSnetwork.com. You can also watch with the NFHS Network iOS app and AppleTV app. Click here for live streaming.